Kisi bhi Mobile phone ki pcb per bahut sari IC (Integrated Circuit) lagi hoti hai. Aaj ki post me hum batayange ki PCB per IC ke pins (legs) ki counting kaise krte hai. Mobile phone ki pcb per bahut sare parts lage hote hai. Small parts, big parts, IC or card level parts on mobile pcb. Aaiye jante hai ki IC kye hoti hai. IC ke andar bahut sare electronic component jaise capacitor, resistance, coil, diodes, transistor se bana ek circuit hota hai. Mobile phone ki pcb per two types ki IC lagi hoti hai. Mobile phone me alag alag parts ke liye alag alag IC hoti hai Jaise Memory Card ke liye MMC IC. 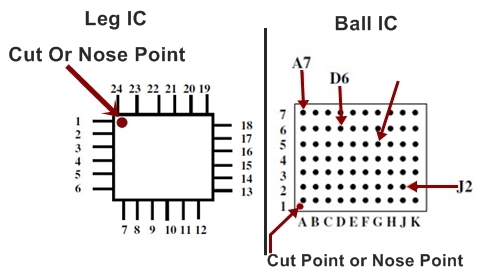 Leg type ic ka mobile phone ki pcb per use hona bahut kam ho gya, aajkal ball type ic ka use adhik or lagbhag har mobile phone me liye jata hai. Leg type IC ke 2 ya 4 tarafo legs or pins pcb per solder hote hai. Is trah ki ic ko Chip IC bhi kahte hai. Leg type ic ke legs or pins ki counting Dot (.) or cut se start hoti hai. But iski counting direction anticlockwise (घड़ी की उल्टी दिशा में) hoti hi. Ball type ki ic ke niche tal me ball gird array (BGA) hote hai. Is type ki ic me legs or pins nahi hoker ic ke painde me chhoti-chhoti ball bani hoti hai. Aajkal mobile phone sets me ball ic ka use hota hai. Ball type IC me rows balls ki counting digit number 1,2,3… me clockwise direction (घड़ी की दिशा में) me hoti hai or balls columns ki counting A,B,C… me anti-clockwise direction me hoti hai. 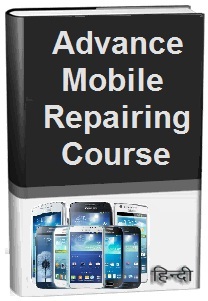 Mobile phone repairing course hindi me learning krte rahiye or mobile phone repairing pdf book in hindi ko bhi download kar skte hai. Mobile repairing me next lesson me hardware or software faults, problems ko solution krna sikhaya jayega. Next lesson ko direct apne mobile phone me receive krne ke liye hamhara free email subscription le.